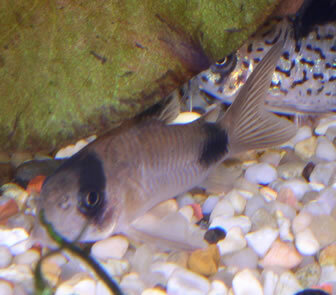 Common Names: Panda Cory Named after the Giant Panda of Asia in 1971 for its similar markings. Company: Keep in schools of 3-4+, 6+ is ideal. Panda cories does fine with basically any peaceful fish. Aquarium Setup: 10-15 Gallons minimum tank size. Sand or gravel substrate, rough substrate is not recommended. Corys especially love a planted tank with driftwood. Feeding: Accepts flake foods, algae wafers, Cory pellets, shrimp pellets, insects, benthic crustaceans, most types of worms including diced earthworms, and most plant and vegetable matter. Sexing: Females are often bigger and heavier, with rounder bellies which make their faces sit up off of the substrate when resting. 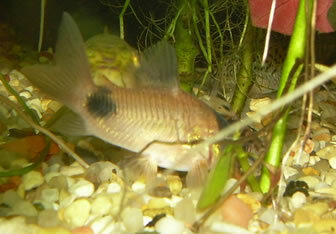 Breeding: Breeding is similar to other Corys, the female carries a few of the eggs between her fins while the male fertilizes them. She then finds a safe spot, usually heavy with vegetation, and hides them. They will continue this process until around 100 eggs have been fertilized. A PH of 6.5 - 7.0 is ideal for breeding and as always using cooler water for water changes can induce spawning.